Wash the potatoes, peel if you like. 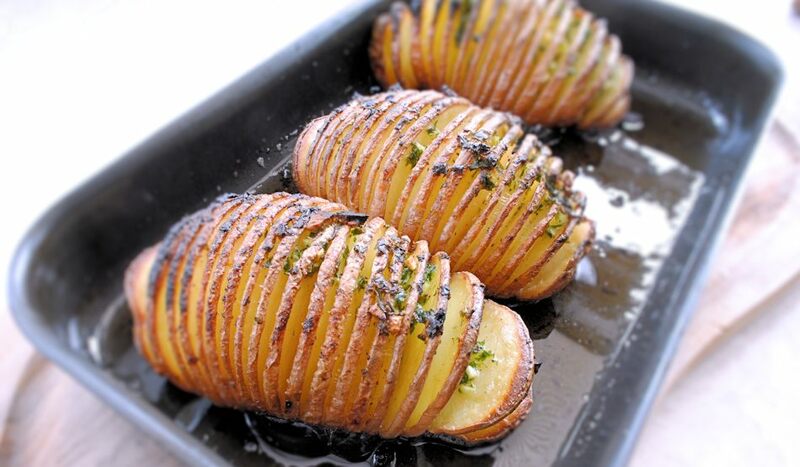 Place each one on a spoon fitting the spud best in size – I used large serving spoon. With a very sharp knife, make incisions almost to the bottom of the potato but making sure the base is intact, about 2mm apart. Heat an ovenproof tray on the hob, melt the butter and oil and add potatoes, sliced side down, when hot. Fry for a minute, then turn them over, baste with the frying oil and butter and put in the oven preheated to 200°C/400ºF/gas mark 6. Bake for 40 minutes to 1 hour, depending on the size. In the meantime mix the herbs into the softened butter and after the first stage of baking baste the potatoes with the herby butter. Return them to the oven for another 10-20 minutes (size! 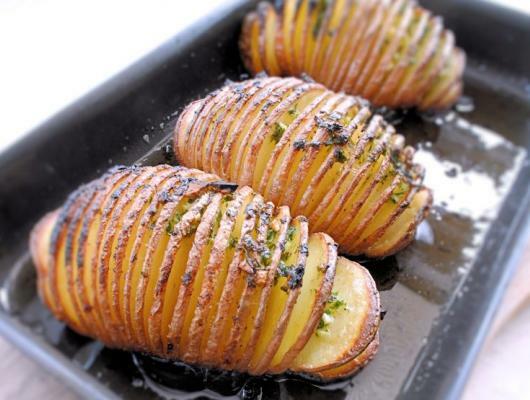 ), check if ready by squashing them gently or pricking with a sharp knife and serve immediately. Isn’t it irresistible to call them Hasselhoff? Easier to make than it sounds, the only caveat is they take longer to cook than you’d have thought. Probably better to use smallish or medium sized potatoes – mine were quite large and started to scorch before they softened. They sell special spoons in Sweden to rest your potato on and insert the knife just to the rim of the spoon, not cutting through the potato. But an ordinary large spoon will serve just as well, all you have to be is careful not to slice through. You can stick any herbs you like into the slots, making sure plenty of butter goes in as well.